Ronkonkoma, NY – The CIRCOR Aerospace Products Group and its Aerodyne Controls business (NYSE:CIR) have announced sponsorship of the Stony Brook University of New York Motorsports Team as an enhancement of its partnership with the school's engineering program. 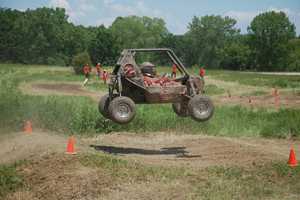 The Stony Brook Motorsports team, formally Mini Baja, has participated in competitions every year for the past 15 years , with steadily improving competition results. The team was ranked number 2 overall in 2008 and 3rd in 2007. The Stony Brook Motorsports team returned this year from the Burlington, Wisconsin Baja SAE Competition with an overall 5th place finish. The team also placed 5th in the endurance race and in car design, out of an international field of 120 registered teams from leading engineering schools. The Baja SAE is a four-day event that simulates real-world engineering design allowing teams of engineering students to design and build an off-road vehicle that will survive the severe punishment of rough terrain. The Stony Brook University Motorsports team is part of the Society of Automotive Engineers, an international society dedicated to the advancement of mobility in land, sea, air and space. As a part of the racing team, student members are in charge of designing and fabricating Baja-style off-road vehicles. At the competition, industry professionals judge students and their vehicles in static displays and dynamic track events, giving students the opportunity to showcase their knowledge and test their designs. As a leading corporate sponsor, Aerodyne Controls will support the Stony Brook Motorsports team and participate in events to help train, educate, and excite the next generation of engineers, all while improving the company’s ability to recruit these sought-after students. CIRCOR Aerospace has an established engineering student intern program in cooperation with California State Polytechnic University in Pomona, California and has actively recruited engineering graduates for full time roles within the company. This year marks the expansion of this cooperative model to the Aerodyne Controls business relationship with Stony Brook University. Aerodyne Controls, a CIRCOR Aerospace, Inc. company, designs and manufactures high-quality pneumatic control components and systems, precision switches and inflation systems for the aerospace, defense, space, and markets.